Habitat: Ferocactus latispinus subsp. spiralis is common in the semiarid regions of Central Mexico in grasslands or on rocky hillsides. The range of this species is south of that of the standard Ferocactus latispinus. It is armed with big spines and a waxy cuticle against both vertebrate and insect herbivores. Only the flower is susceptible to predation. It grows in association with other plant species, including Mammillaria carnea, Coryphantha elephantidens, Coryphantha calipensis, Stenocereus stellatus, Stenocereus beneckei, Stenocereus pruinosus, Stenocereus marginatus, Stenocereus treleasei, Stenocereus dumortieri, Myrtillocactus geometrizans, Pachycereus weberi, Polaskia chichipe, Escontria chiotilla, Opuntia decumbens, Opuntia pumila, Agave lophantha, Agave macroacantha and Tillandsia pueblensis. 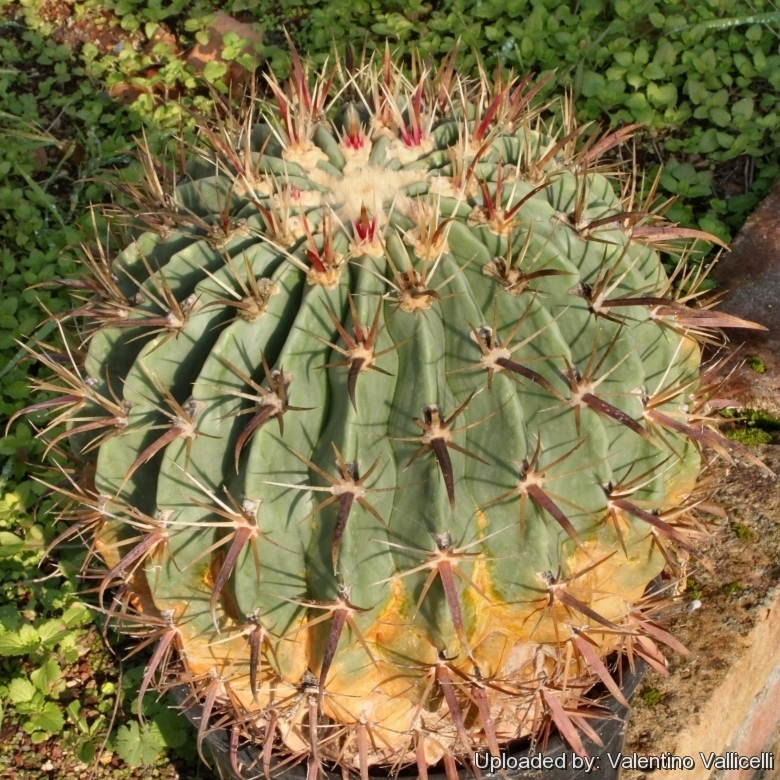 Description: Ferocactus latispinus subsp. spiralis (formerly known as Ferocactus recurvus or sometimes as Ferocactus nobilis) is a modest-sized, winter blooming barrel cactus that is distinguishable from the standard Ferocactus latispinus for the more elongate to cylindrical stem, fewer and stouter radial spines and only one longer central spine.